Cooper Wiring Device Polarized straight body plug comes with solid brass plug blades that are firmly embedded in the body. 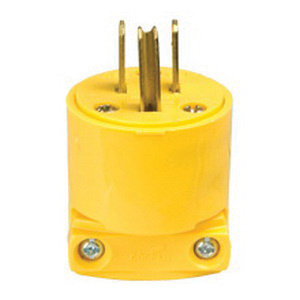 This vinyl plug and connector resists chemical attack and is less brittle in extremely low temperatures. The terminal screw clamps are designed to contain wire and prevent binding. It is suitable for commercial use. Straight body plug meets UL498 listed File No. E15012, NOM, CSA certified to C22.2, No. 42 standards.